This up-to-date, highly readable, theory-based, and application-oriented book fills a crucial void in literature on couple therapy. Few books in the couple therapy market bridge the gap between theory and practice; texts tend to lean in one direction or the other, either emphasizing theory and research with little practical application, or taking a cookbook approach that describes specific techniques and interventions that are divorced from any conceptual or theoretical base. However, couples therapy requires a high degree of abstract/conceptual thinking, as well as ingenuity, inventiveness and skill on the part of the therapist. 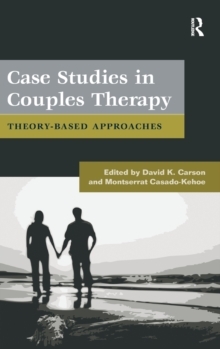 Case Studies in Couples Therapy blends the best of all worlds: clinical applications with challenging and diverse couples that have been derived from the most influential theories and models in couples and family therapy, all written by highly experienced and respected voices in the field. In Case Studies in Couples Therapy, readers will grasp the essentials of major theories and approaches in a few pages and then see how concepts and principles are applied in the work of well-known clinicians. The case studies incorporate a wide variety of couples from diverse backgrounds in a number of different life situations. It is simultaneously narrow (including specific processes and interventions applied with real clients) and broad (clearly outlining a broad array of theories and concepts) in scope, and the interventions in it are directly linked to theoretical perspectives in a clear and systematic way. Students and clinicians alike will find the theoretical overview sections of each chapter clear and easy to follow, and each chapter's thorough descriptions of effective, practical interventions will give readers a strong sense of the connections between theory and practice.